We want everyone to enjoy their time with us. With this in mind, we ask that all visitors follow our simple park safety rules. Our waters are great for fishing, observing nature and relaxing, however, they are not for unsupervised swimming. Our Rutland Water Beach situated at Sykes Lane, offers visitors a safe environment to cool down in the summer months with trained lifeguards on watch throughout the season. The constantly low water temperature, even on hot days, can cause hypothermia or send the body into shock in just seconds. The shock from cold water sees blood pressure rise, breathing become erratic and heart rate increase. Even strong swimmers can start to panic. 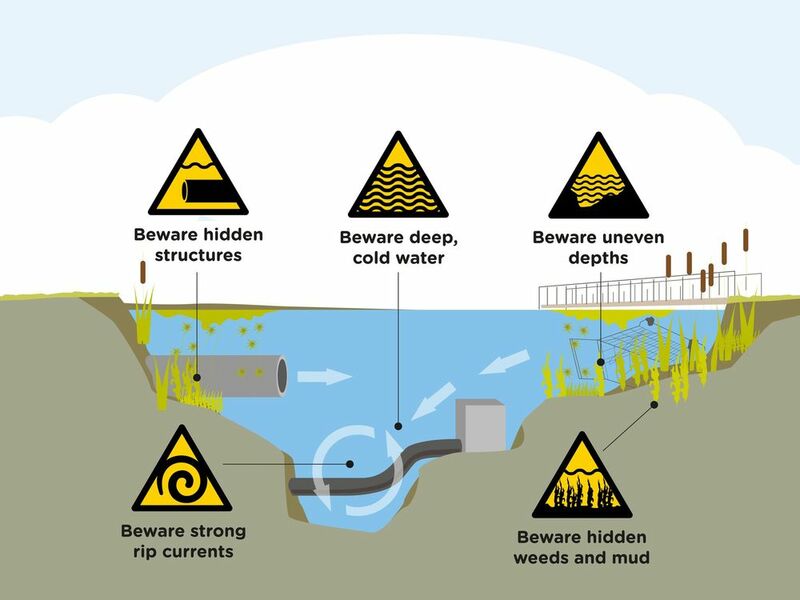 Hidden machinery, such as underwater pipework, dips, drops, weeds and mud, not to mention strong currents, make swimming difficult and hazardous. Even the strongest of swimmers can get into difficulty when swimming in reservoirs. Very deep in some places and shallow in others, jumping or diving is a risk you should never take. Steep, slippery banks can make getting out of the water difficult. Poor/no mobile coverage can delay getting assistance. Remember, when choosing to swim in risky or prohibited areas, it is not just your life you risk but the lives of those who try to help you. Our waters often host events such as the Great East Swim, triathlons and open water swimming. These events are well planned with appropriate safety precautions in place and provide great opportunities for you to experience our parks in the water.